After the preparatory phase in October 2016 the International Conference “Women in Rural Areas and Cross-Border Cooperation” – towards the celebration of the International Women`s Day, was held on the 6th of March 2017 in Novi Sad. 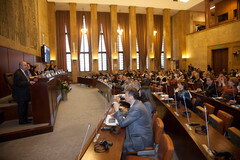 More than 120 people attended the Conference, that highlighted the challenges and opportunities facing rural women and their roles in decision-making processes. Experts from different fields gave an overview of the problems regarding women in rural areas and how to solve them. In several discussions, each participant could give his one opinion towards the topic and had the opportunity to talk about the personal experiences. Furthermore, the Working Group on Empowering Rural Women worked on the creation of the sustainable project to empower and support the women in rural areas and help them to overcome everyday issues that they face. Therefore, a platform will be established to share the knowledge and information of the several experts and to provide a place, where everyone can get help related to the issues of women in rural areas.